A man who brought a gun to Palomar College, telling deputies he intended to get into a shootout with them, pleaded guilty Wednesday to a felony charge of carrying a loaded firearm onto a college campus. Luis Bolanos, 23, faces up to four years in prison when he is sentenced May 14, said Deputy District Attorney Meredith Claterbos. 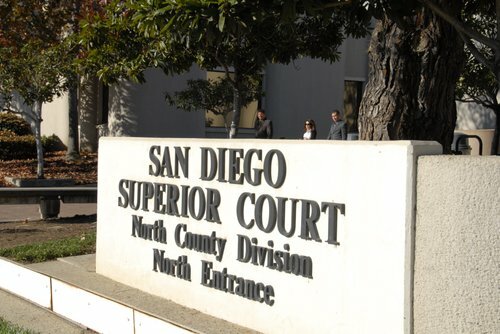 San Diego Superior Court, Vista. Photo credit: court-house.org. The defendant pleaded guilty on the day his preliminary hearing was to take place. Bolanos called authorities on New Year’s Eve, saying a man had shot his cousin around 6:30 a.m. in Escondido, according to San Diego County Sheriff’s Department officials. Deputies could not confirm that the shooting occurred. Bolanos told authorities that he was armed with a handgun and headed to Palomar College, and that he intended to shoot it out with sheriff’s deputies. Sheriff’s Sgt. Paul Michalke said Bolanos gave authorities his own description, including what clothes he was wearing and his location on campus. The school, closed for winter break, was sealed off as deputies searched for Bolanos, who was arrested without a struggle near the western edge of the college while in possession of a loaded small-caliber handgun, Michalke said.